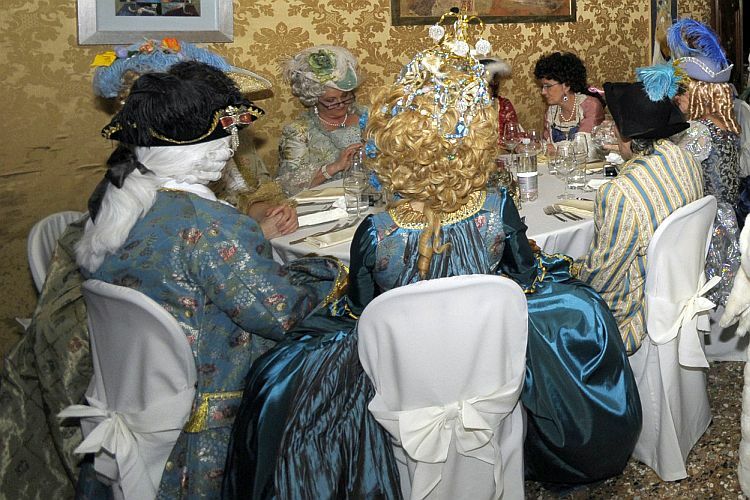 Have you ever wished you could travel to Venice’s glorious past and dine in fancy dress in a beautiful Venetian palace? You can do just that with this special themed cooking class offered by Cook in Venice. First you’ll visit the famous Rialto market to help choose fresh, seasonal ingredients for your cooking class. Then you’ll go to a 15th century palazzo for appetizers and local wine. Next is your 3-hour cooking class taught in English by 2 Venetian cooks, Arianna and Monica. You’ll prepare typical Venetian dishes and enjoy them for lunch following the class. But before you dine, you’ll get to change into your 18th century Venetian carnival costume that has been prepared in advance just for you! You’ll dine in the palace’s grand hall in fancy dress just like you would have a couple centuries ago. 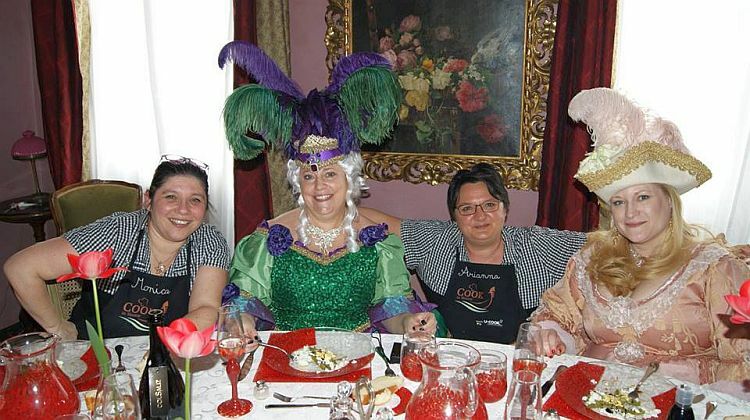 If you’re not into dressing up though, you can just take a cooking class with lunch in the 15th century palace or choose from one of the other cooking programs offered by Cook in Venice including a 3-day Venice culinary tour. Boats are the major mode of transportation in Venice and taking a gondola ride is a favorite activity of tourists. If you’d like to learn the traditional Venetian rowing style of the gondolier for yourself and get a unique insight into Venetian culture, take a Venetian Rowing Lesson. Your 1.5 hour private lesson, taught in English, will take place in a batela coda di gambero, a traditional wooden boat that’s a little more spacious and stable than the gondola. Few tourists get the opportunity to glide through the canals of Venice while standing at the helm of a boat. You’ll learn about the historical boats of Venice and get to row one for yourself! Or sign up for rowing plus food and wine for more traditional Venice experiences. Venetian carnival masks are one of Venice’s most famous crafts. While there are many cheaply made replicas available in tourist shops, high-quality masks are still made by hand by artisans in small workshops in Venice. Learn more about the traditions of carnvale masks and costumes and decorate your own mask in The Craft of Mask-Making. This 1.5 hour workshop takes place in the workshop of a traditional Venetian artisan and is a great activity for families. After being introduced to the characters represented by the traditional masks and seeing carnival costumes, you’ll be able to choose and decorate your own mask. Rather than just bringing home a souvenir, you’ll take home a real memory of your time in Venice. Use promo code ITALYMARTHA FOR 5% off these small group tours Venice highlights tour with gondola ride or a food tour with gondola ride.. If you’re looking for a unusual guided tour, try the Doge’s Palace Secret Itineraries Tour, a unique way to see the Doge’s Palace (not available in July, August, or winter season). 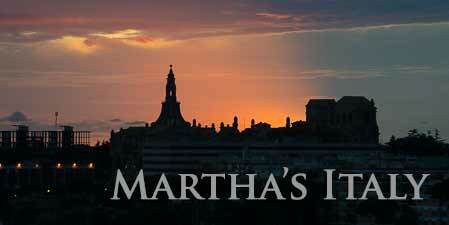 On this small-group tour you’ll visit exclusive places not normally open to the public in including the office of the Great Chancellor, prison cells and torture chambers, and a walk across the famous Bridge of Sighs. 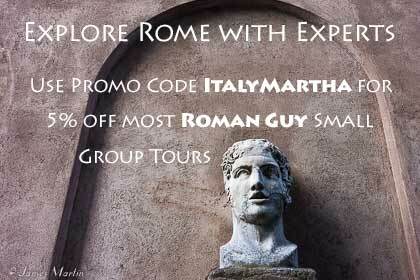 Save 5% off this tour, too, with promo code ITALYMARTHA. Find a hotel in Venice. See if one of these Museums Passes would be helpful to you. Book train tickets on Rail Europe in US dollars.